As we flew into Seattle, I noticed…hills. Somehow that surprised me. I didn’t expect hills. Mountains, of course, but not hills. When I turned to Rich to mentioned this, he smiled and told me that there were several unique neighbourhoods built on the seven hills of Seattle. Ah, he had done his homework. Me? I’d just been dreaming. Here was another surprising thing I found: In all the photos you see, you imagine the Space Needle to be right in the thick of Downtown. In fact, it’s in North Seattle. It’s within walking distance from Downtown, sure, but it sort of stands apart from the other buildings. 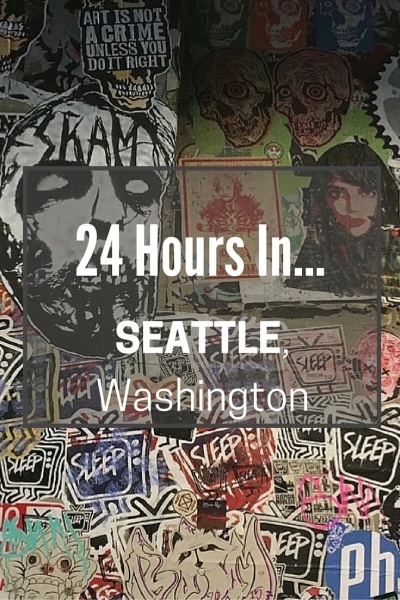 We had 36 hours in Seattle. It wasn’t nearly enough time to see everything we wanted to see in the city AND explore the surrounding area too. We had to prioritize. We arrived late into SEA-TAC, taking the light rail to Downtown and then the Monorail to the Space Needle. So easy. Why don’t all cities provide such an easy transport system from their airports? We found our hotel, which I won’t be recommending, dumped our bags and headed out despite the rain and our looming jetlag. 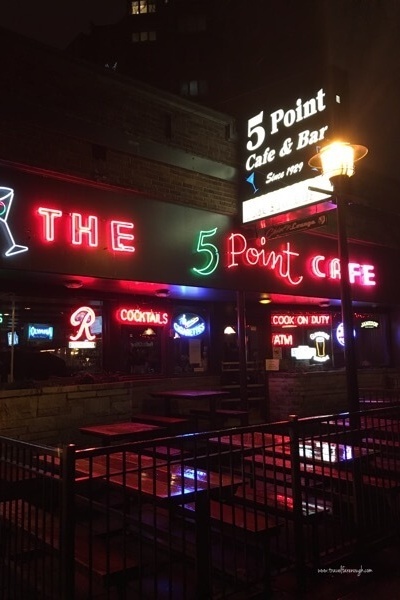 We found 5 Point Café & Bar. OMG. This place was hilarious. It’s a cross between a pub and a café, offering cheap beer (order a Mannys) and damn decent food (the onion rings were divine!). It’s just a funky dive, but a dive with history. 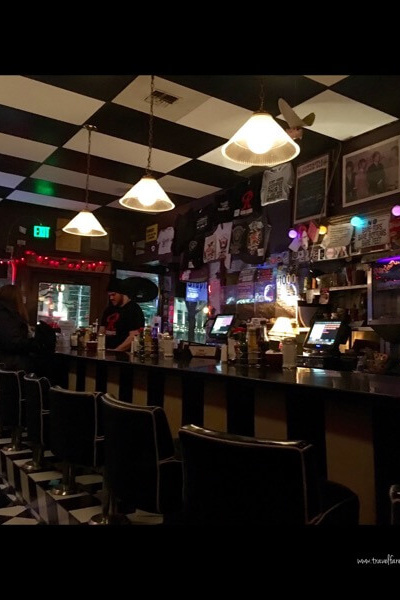 It’s the longest family run eatery in Seattle and the oldest bar still in existence in Belltown. The signage posted over the walls is obnoxious, funny and definitely R rated. If you like hole in the wall places with great food and service, this place is for you! The following morning, a Sunday and Valentine’s Day no less, we were up and out by 8.30am. 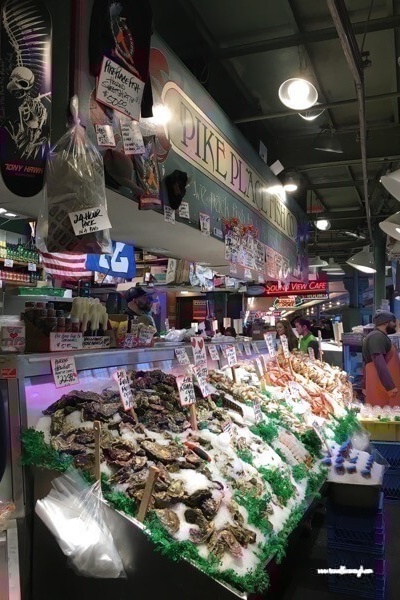 We had an appointment with Savor Seattle Food Tour at Pike Place Market. Sans caffeine and sleep, thanks to a noisy Hispanic family next door, we showed up bleary eyed to the Market Theatre. Our meeting point was down an alley adjacent to the disgustingly intriguing gum wall. Yes, the people of Seattle have made sticking gum on an alley wall into an art form. It was an interesting start to the day to say the least. Once the Tour was done, we tried to check out more of the market ourselves. After getting gridlocked inside the marketplace, claustrophobia had us heading out and fast! Seriously, you have to get to the market early to really enjoy it. From the market, we headed to the waterfront. The waterfront area was okay. They have a Ferris wheel that overlooks Elliot Bay, and the usual assortment of tourist shops and restaurants. But, compared to Sydney’s waterfront, it was pretty lame. I was disappointed that Seattle hadn’t invested more in the area between the markets and the Ferry terminals. Maybe that’s because there are so many OTHER waterfront areas to explore? I’m not sure and I’m now curious to find out. 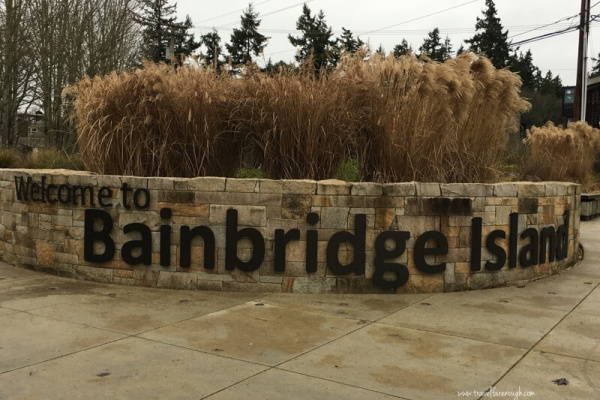 We decided our next move would be to experience a Living list item: Take the ferry to Bainbridge Island. Despite the lousy weather, the ferry was quiet and smooth. In fact, it left the marina and I didn’t even notice. I was too entranced by the ferry and the wonderful views of the city. We walked up the stairs to a higher level and then it happened: My McDreamy Moment. 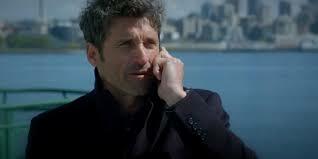 I could just imagine Derek on the phone with Meredith (Grey’s Anatomy) as I headed up those stairs. It was surreal. When I got my head back to reality, I enjoyed every moment of the ferry journey. The views all around were gorgeous, more so as we got closer to Bainbridge Island. I only wish we’d driven over so we could have explored the Island more. It just means we will have to return. But exploring Winslow, the town where the ferry terminates, was great. We poked around the shops in town. Of course, we had to pay a visit to the bookstore. Eagle Harbor Book Co. is one of the best bookstores I’ve ever been to. They highlight local authors brilliantly. We headed down toward the marina and watched a pair of seagulls fight over a crab pulled in from a dive into the water. When the wind and wet got a little too much, we found the AleHouse on Winslow and enjoyed a cold beverage or two while we waited for our ferry. We reflected on our day as we headed back into Seattle at sunset. It was such a great, relaxing afternoon. But we weren’t done. There was still more to see. We were pretty famished by this point. Directed by a new app, we went to find a place to eat. But it was Valentine’s Day. Had we planned ahead? No. The place we picked was packed, but we were lucky to be seated right away. The waiter delivered waters and the menus, but nothing about the restaurant or the menu was appealing. We left and headed to a Mexican place across the road. The universe was on our side apparently. Keep in mind, we lived in Texas for 20 years so we know Mexican food (and not just Tex-Mex either!). 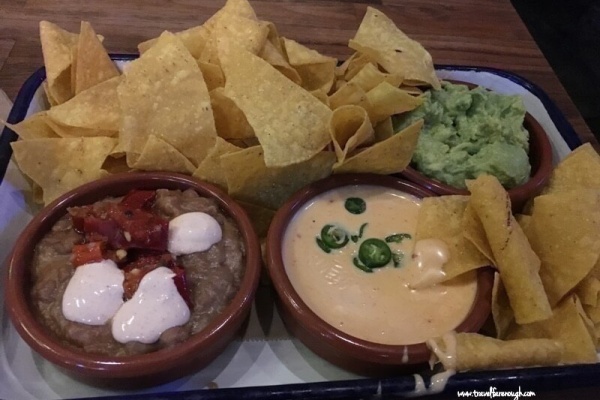 While it’s hard to find good Mexican in Sydney (yet, we have), the place we found across the road, blew everything we have ever had out of the park. Seriously. The name? Cantina Leña. It’s located at the corner of 5th and Lenora on the street level of The Martin residential building. We ordered the Three Amigos to start, followed by the chile-braised lamb. Make sure you order the pinto beans on the side. And the margaritas aren’t too shabby either. It’s the holy grail of Mexican food that we’ve discovered so far. After a meal like that, we had to walk it off so we headed back toward the Space Needle and wandered around the square. I think the mist and the cover of darkness made everything even more beautiful. The shimmering lights cast ghostly reflections into the air. The Chihuly glass sculptures dripped with raindrops, glowing ethereally. The shadows played tricks on our eyes as we admired the gorgeous Gehry designed EMP Museum. 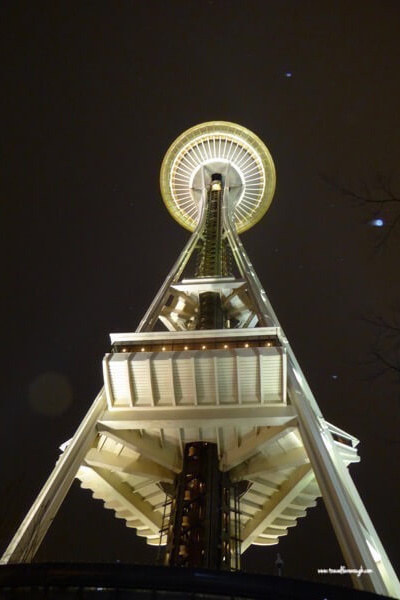 Gazing up to the towering Space Needle conjured thoughts of floating amongst the clouds. It was the perfect ending to our day. Will we be back to discover more of Seattle? No question. There were things we still didn’t get to that we really wanted to see. Besides that, Washington state is now on our list to ‘possibly settle’. Neither of us are surprised about that. Savor Seattle VIP Early Access Food Tour. Ask for Mark ‘Poppins’ to be your tour guide. EMP Museum – just to gaze the perimeter was amazing. Gehry has amazed me once again. REI Flagship store: Have your mind blown at how vast this place is. 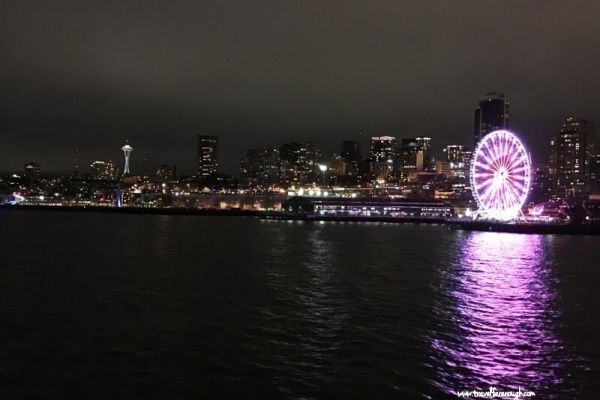 Washington Ferry to Bainbridge Island: Enjoy the gorgeous surroundings as you make your way to Bainbridge Island and back. AleHouse on Winslow. Great spot to sit and watch the comings and going over a cold brew. Eagle Harbor Book Co. One of the best bookstores I’ve ever visited. A great, funky dive to sit and take in the fact that you are in Seattle, the birthplace of grunge music. 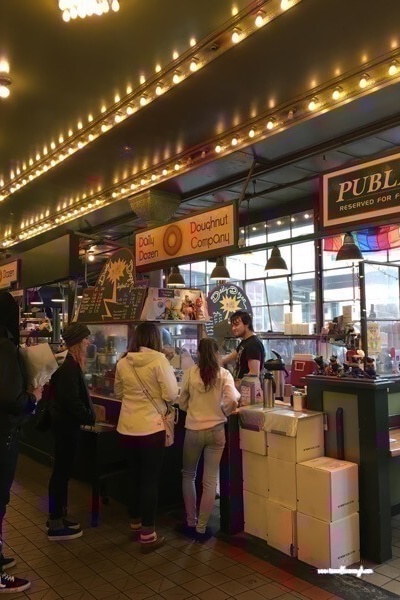 Take a tour and you get to sip local coffee, nibble on delectable maple bacon doughnuts, and explore locally made specialties as you eat your way through Pike Place Market! You won’t be hungry for a while afterwards! The holy grail in Mexican food. Kerry Park: For amazing views of downtown. Unfortunately, the weather didn’t comply for us. Fremont Troll: An 18-foot tall stone troll that lives under the Aurora Avenue Bridge. Serious Pie and Biscuits. We stopped by Serious Pie on our way to Cantina Leña and it was already packed, so we kept going. Beneath the Streets Seattle Tour. An underground tour of Seattle. Theo Chocolate – A seriously great chocolate making tour. The Chocolate Box – Think of a hot chocolate made of pop rocks, dark choc and chili. Mouth-watering stuff!